Airship's Revenge is an e-Reader level for Super Mario Advance 4: Super Mario Bros. 3. The level contains five Advance Coins. Its difficulty rating is 3/5. This card and several others came bundled with the first shipment of Super Mario Advance 4 to Walmart stores in North America. In Japan, it came bundled with the October 2003 issue of CoroCoro Comic. It is considered one of the rarest Level Cards in the Super Mario Advance 4 e-series. The level was later made available through the game's Wii U Virtual Console release in 2016. Both versions have Morton Koopa Jr. on the key art, and is the only one of the three PR level cards to feature one of the Koopalings as part of the key art in the Japanese version. The level takes place on an airship. Like in most airships, the screen scrolls automatically. Mario begins the level on platforms attached to the bottom of the airship. A ? Block containing a power-up is found, along with an Advance Coin. The screen then moves to the left, and another ? Block is found. A Rocky Wrench and two Cannons are then found. A second Advance Coin is found above the Rocky Wrench. Two Burners are then found. The screen begins to moves down, and more Rocky Wrenches are encountered, along with the third Advance Coin. More Cannons, Rocky Wrenches, and Burners are then found, along with a ? Block containing a Super Leaf. 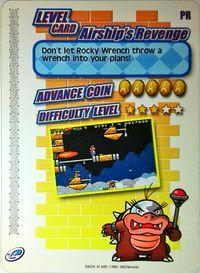 A fourth Advance Coin can be found as the screen moves upwards, and the fifth Advance Coin is found above a platform along with a Rocky Wrench. After a few more Burners and Cannons, a Warp Pipe is found. Morton Koopa Jr. is found through the pipe, and must be defeated in order to finish the level. English: Don't let Rocky Wrench throw a wrench into your plans! Hikousen no gyakushū! Revenge of the Airship! This page was last edited on April 11, 2019, at 20:24.